Custom designed from the cake and decorations to games and entertainment. We even include a special gift for each child. We think of everything so you don't have to. Party Cape can handle your next party, event or function. From a Birthday Party to a Cocktail Party, Anniversary, or family gathering, we will make your next party or event fun and memorable. We can do it all or give you just a little help in one area. Give us a call. Party Cape personalizes your Graduation party to make your graduate feel special. We come to your location or we can find the perfect location for you. From the centerpieces to the games, having fun and making memories with your graduate is what's most important. We love Cape Cod and there is nothing like a Old Fashioned New England Clambake. We come to your site and set up a fun filled clam bake customized just for you. Steamed not boiled. We include games, centerpieces and fun favors that make your clambake unforgettable. Check out our party page for some fun videos. Need a gift in a hurry? We have you covered! 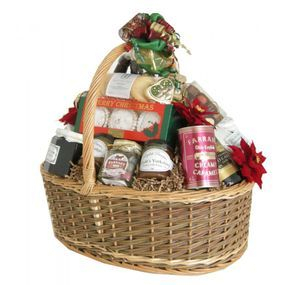 We have put together beautiful gift baskets decorated with ribbons and bows and wrapped in cellophane. You can include your special gift or you can choose from our wide selection of gifts and create your own personalized basket. Plus we deliver to any location 25 miles from our shop...that means your covered from Orleans to Falmouth to Wareham. Fill out the form below. Be sure to include your phone number we would love to talk with you.